As promised, here is the blog post about my 365 day “Happiness is” project which just wrapped up in April – reflections, thoughts, and what’s next! In case you aren’t familiar with my project – I decided to draw and post one illustration about happiness every day for 365 days back in April 2014 after watching a very inspirational video of Lisa Congdon’s speech “Embrace the Abyss“. Lisa is an artist/friend I admire so much and was talking about how she practices going out of her comfort zone every day to help her grow as an artist. I sort of made this decision very quickly without thinking how hard it could be or knowing if I had enough materials to draw for 365 days. I also felt very vulnerable about sharing my imperfect drawings on the internet. Who would care? What if I get mean comments?? But there I was, determined to follow through with my words, and I did it!!! AHHHHH!!! getting ready to be scanned in. You can find something to feel grateful for even on the crappiest days of your life. You draw not because you have an inspiration. You draw because you have to. People are not paying as much attention to your imperfections as you are. Let go. Your success should be about your commitment to growth and learning and not just about how many followers or “likes” you get. Showing up every day as your authentic self is a hard work. Only way to get better at something is to practice a lot. It’s all about the relationships you develop with the people who support you. Nothing good comes from comparing yourself with others. Never. I have a couple of art shows coming up in Seattle area this summer. I will be showing and selling some of my original work from the Happiness is project there. I would LOVE to turn them into a small gift book. Need to do more research on how to go about it. If anyone has any ideas of publishers or self-publishing resources, I welcome them! I’m taking a break from doing this kind of project for a while but would love to start a new daily (or maybe weekly) project again in 2016! I want to help other artists find their voice through regular practice and self-reflection. I don’t know what this looks like yet, but I’m excited to brainstorm ideas. Last, but not least, my big goal for this coming year is to write more. Writing about my process, life, struggles and successes. So, here it is again with my public commitment – I will publish a regular blog post every Sunday starting June 7!! Making my commitment public really helps to hold myself accountable. Eeeeek! OK, that’s it for now. Thank you for being there for me as I move through life. I will keep you posted on my goals and plans as I go on my weekly blog posts!! 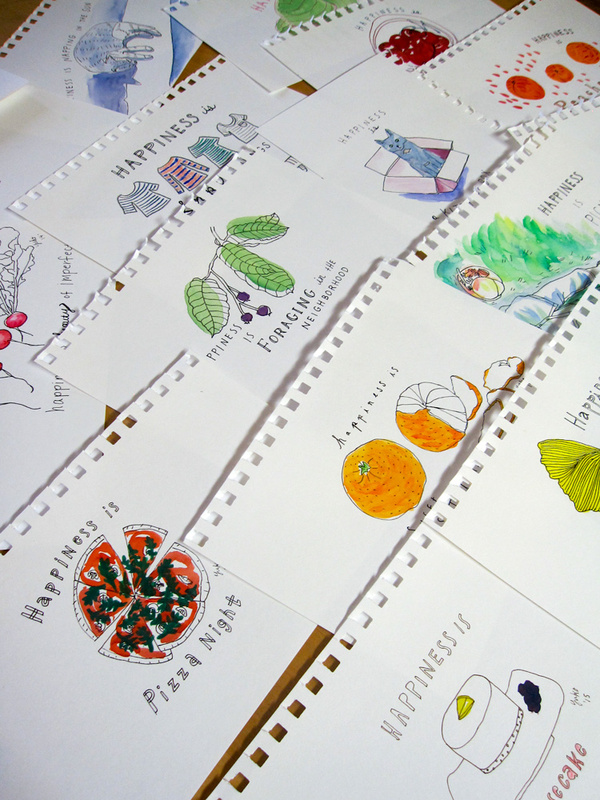 Your 365 day “Happiness is” project is very inspiring, and I can relate so much to it! Like “you draw because you have to,” comparison is the thief of joy, and also finding little things to be thankful for. I can’t wait to hear more about your process in your future blogs, and about the art shows! So great and inspiring! i’ve been loving seeing your drawings your every day. I have loved seeing your posts and loved hearing your reflection on the project. Looking forward to your writing posts!